Frigate 'INS Tarkash' under construction at the Yantar shipyard in Kaliningrad is due to be handed over to the Indian Navy next month. INS Tarkash is the second Talwar-class ship being built for Indian Navy under a contract signed in 2006. Frigates of this class are designed for anti-submarine, surface ship warfare, as well as air defence. Length of the ship is 125 meters; beam is 15 meters; displacement is about 4,000 tons; full speed is 30 knots; cruising range at 14 knots is 5,000 nautical miles; crew strength is over 200 men including 20 officers. Yantar shipyard won the tender for three such frigates and began construction of the lead ship INS Teg in the summer of 2007. Afterwards, building of other ships started – frigate INS Tarkash (laid down in Nov 2007, launched in 2010) and INS Trikand (laid down in June 2008, launched in May 25, 2011). 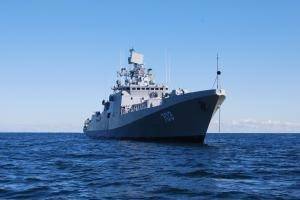 First three Project 11356 frigates were built by Baltiysky Zavod shipyard (St. Petersburg) in 1999-2004, commissioned into Indian Navy and are currently in service. The second trio of frigates has different armament. In contrast to the first frigates armed with Club-N missile system, ships built by Yantar have BrahMos missile systems jointly developed by Russia and India.